This photograph shows Dillingham Field in the middle 1960s. 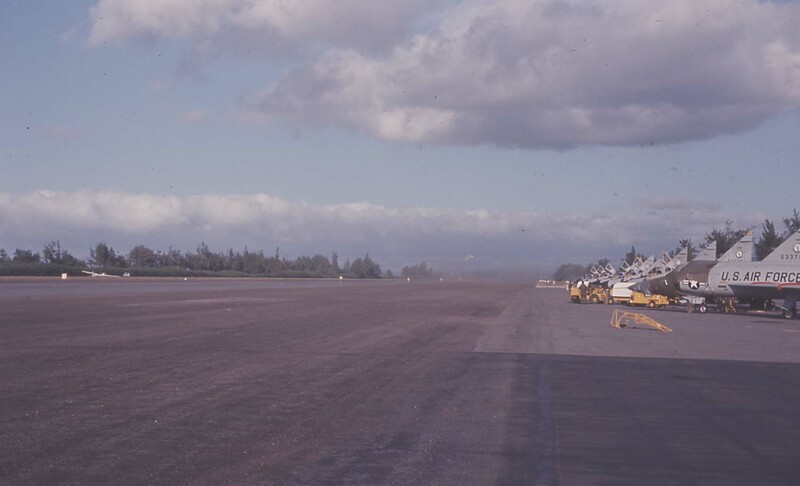 After the then-154th Fighter Interceptor Group converted to F-102 Delta Daggars in 1960, some of the annual summer camp training was done at Dillingham Field. After hour activities included barbecues, music by some talented Guardmembers, and fishing on the beach across the runway. This undated photograph was taken prior to the 199th Fighter Squadron adopting the Hawaiian tail flash. This tail flash became the standard for all HIANG aircraft. In the photograph, the aircraft still have the old round Air National Guard logos on the vertical stabilizer.